Of all the ‘mainstream’ US custom builders, Darwin Motorcycles is one of the few that produce the kind of bikes we like. 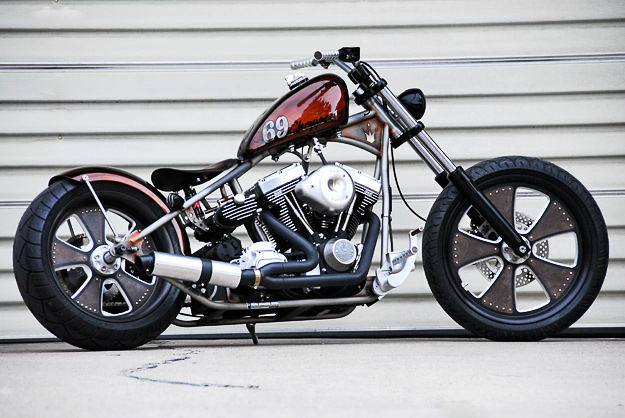 The latest model under the Brass Balls brand is called the 69 Chopper—a reference to the year, we’re told—and it’s based on the machine that came third in the Production Class at last year’s AMD World Championships. What’s good about it? Firstly it’s compact, and secondly it apparently handles extremely well. The super-clean styling seems to take cues from the Japanese custom scene—and transplant them firmly back into America. The 69 is packed with components from Leroy Thompson and Crime Scene Choppers, and the stock configuration includes an 80-ci Harley Evo motor. But you can also specify engines from S&S or Crazy Horse; personally, I’d take S&S’ retro-styled 93-ci Shovelhead motor. Even better is the price, which starts at just $19,995. If you have some spare time, it’s worth checking out their site for a textbook example of how to market custom motorcycles in the USA.